The factory is concerned about environmental issues for their workers and the environ with the toxic potential of finishes. The finish that is used is’drapped’ on the wood and used a sparingly as possible. Little more than wiping with a rag is needed to keep the wood in fine finish. If you need, a wiping with a vinegar and water solution, followed by a dry cloth should be all that is needed. Murphy Oil Soap works well too. Follow the directions on the container. Waxes, oils or polishes should not be used unless damage or discolorations need repair. 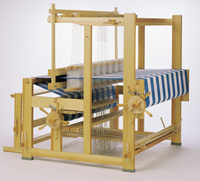 Glimakra looms and equipment are made to assemble easily and be secure. Tighten components to secure them but excessive tightness is generally not required. Don’t ‘crush’ the wood by over tightening. We can usually replace missing bolts and nuts or other parts. Remember that wood responds to changes in the environment. Great care is taken in selecting the wood, handling it, milling the pieces, laminating and in the joinery. The result is a well made loom that the makers are proud of and the looms can easily outlast several generations of weavers. Laminations make for a stronger piece and reduces tendencies to warp, twist, cup or bend. To futher protect the trees of the world, Glimakra is using ‘finger jointed’ laminations. This allows for the use of smaller and younger trees protecting old growth. As a further benefit, the lamination actually makes for a stronger piece and greatly reduces tendencies to warp or twist. Indeed the use of such wood also also them to avoid the incorporation of knots and other defects of full length wood. Standard looms come in 6 boxes. The largest is the box for the side frames which measures approximately 10 inchs by 10 inches by 68 inches and weighs about 80 pounds. The remaining boxes are shorter and lighter weight. 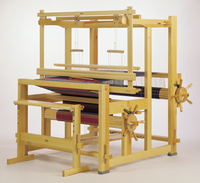 Glimakra looms are made of wood from the tree Pinus sylvestris which also known by a mutitude of common names such as Scots pine; tall (Swedish); skovfyr (Danish); sosna obyknovennaya (the Russian name); or in Polish as sosna zwyczajna. You may also see it called Baltic, Finnish, Swedish or Polish pine. The tree grows up to 130-140 feet tall in good conditions. The more finely grown trees are in the northern latitdues and produce a wood with tight rings (from slower growth). Note, too, the medicinal value of the tree. Like other evergreen trees in places with grim winters, the Scots Pine has been used in various brews, from teas to ale, as a useful source of Vitamin C when there are few other green leaves available. An excellent example of this usage were the Pine and Spruce beers of the Vikings and other Nordic people. They were medicinal tonics which were not only used as home, but also by seafarers to keep Scurvy at bay and to fight infection. Captain Cook and many other explorers followed the Viking example of having Pine and Spruce beer supplies….Todays 7.5% alcohol version is produced by the Heather Ale Ltd in Craigmill near Glasgow. We hear of many looms stored in less than desirable conditions. The result is water damage, discoloration, warping and mildew/molds. Storing a loom in direct sunlight will hasten the discoloration of the wood and promote its weathering. Basement storage often results in water or mildew problems. Put the loom parts up off concrete floors or damp areas on blocks or other means to reduce water damage potential. Store parts flat or upright to minimize potential warping of compoments. Give a loom brought from high humidity storage time to dry before assembly. Storage outside or in a breezeway is not encouraged. It is risky. The looms will last generations with a bit of care.